Summer 2018 has proved very challenging for Irish farmers. Unpredicted drought conditions have resulted in extreme difficulties for farmers feeding their livestock, and many have been forced to incorporate a range of different forages and concentrates into their animal’s diets. 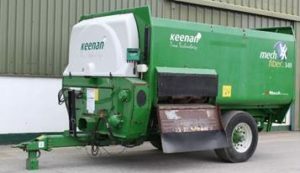 In response to this, KEENAN is giving farmers who do not own or have access to a mixer wagon the opportunity to rent a KEENAN machine, to help deal with the difficulties in feeding their livestock. The rentals are from a stock of recent KEENAN trade-in machines. The KEENAN MechFiber34E140 is an example of the stock of used mixer wagons available to in the rental scheme. The KEENAN mixer wagon rental proposal gives farmers who do not own a mixer wagon the opportunity to rent a machine for three months. “Although there are some changes predicted in the weather forecast, the extreme impact of the last two months of dry conditions will continue to affect farmers for the coming months,” said Higgins. To assist farmers with evaluating their feeding options and to generate a feed budget for the coming months, the rental scheme also includes the opportunity for farmers to benefit from an InTouch on-farm visit, paired with continual InTouch support from a team of leading nutritionists. “By providing farmers with an option to rent a KEENAN mixer wagon and utilise the InTouch nutrition support service for three months, we hope this will instill some control back to the farmers and, in turn, get them back on track for the winter ahead,” said Higgins.